Most Australians spend their national day outdoors around the BBQ with friends and family. For those contesting the Audi IRC Australian Championship, Australia Day marks the half-way point of the nine-race series and thoughts of snags grilling are far from competitors’ minds. Points are close in all three divisions with a marginal buffer between the top three placegetters. After four races and with five to go, Marcus Blackmore’s TP52 Hooligan leads Rob Hanna’s Royal Geelong Yacht Club based Shogun V by four points in IRC division B with Jason Van Der Slot’s fellow TP, Calm 2, only two points adrift in third. Hanna was unusually quiet this morning, but smiling given things have tightened up after yesterday’s distance race. 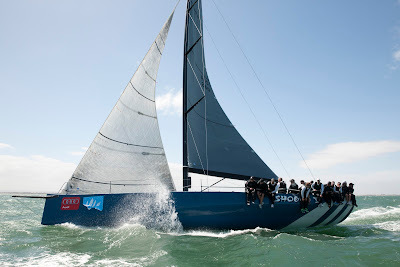 In IRC division B three Beneteau First 45s are lapping up the conditions, from light on day one on Thursday to cold winds up to 30 knots when yesterday’s front hit midway through the race to mid Port Phillip and return. Bruce McCraken’s Ikon is on eight points, Alan Woodward’s Reverie on 10 points and Chris Manton’s Senna on 15, skippered by Brendan Garner. With another five races scheduled, there are still plenty of opportunities to close the gap and for the division B leaders to trade places. 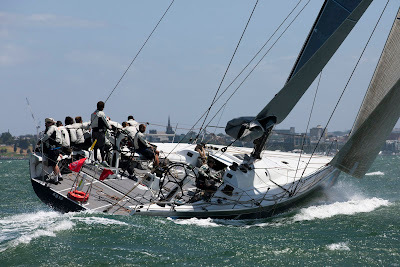 IRC division C leader Executive Decision, Grant Botica’s Royal Yacht Club of Victoria Adams 10, has plenty riding on his second half efforts - he’s in the running for a potential third divisional win, and this time he’s playing for a larger bounty. IRC contenders are racing for the honour of being named best performing handicap boat and an enviable goody bag including an Audi branded Code 2 spinnaker, proudly produced and supplied by North Sails Australia, along with a custom designed Audi IRC Australian Championship trophy for the class winners. Second placegetter's receive an exclusive dinner or lunch for two people at either Matt Moran's Sydney or Brisbane restaurant ARIA or Shannon Bennett’s Vue De Monde in Melbourne. Third placegetters in each class will receive an Audi Sailing Sport team ‘uniform’ including sailing jackets, polo shirts and sailing caps. Back-to-back IRC Class A winner, Marcus Blackmore was proudly flying his North Sails Championship chute for yesterday’s distance passage race in which the crew staged an almighty comeback to go from last boat past Point Henry, following an unplanned pit-stop on the sand, to third in division. Not many could have picked off so many but this is no ordinary boat, or team, and yesterday Blackmore had a direct line above, riding the coattails of the south-west change up to the frontrunners which put them back in the hunt. 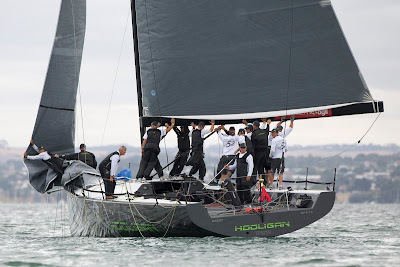 The Hooligan crew were circumspect, and relieved at the end of the day’s race as the whole fleet took a breath after the high pressure salt-water hose down. Today’s forecast is for southerly winds turning south-east then back to south-west. Weather is expected to bring a partly cloudy day with some showers developing this afternoon/evening. Locals say the bureau’s predictions should be pretty much on the mark, they are anticipating between 15 and 22 knots of SE to ESE. The Audi IRC Australian Championship fleet returns to windward/leeward racing today with up to three races scheduled for course area D on outer Corio Bay. The first race is due to start at 12:30pm.